Zombie Speed Limit Pet Baseball Shirt for Small Dogs Happy Halloween Everyone! Are you getting ready to show some Halloween spirit in you? 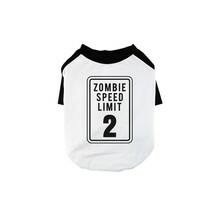 These cute Halloween pet shirts are perfect for your pets to wear on the scariest and funniest night of the year! Make the last day of October wicked and haunted with our unique Halloween pet shirts that show blood, zombies, monsters, vampires, witches, and more. 365 In Love/365 Printing Inc offers unique Halloween baseball shirts for your dogs and cats. Our dog raglan shirts/cat raglan shirts are made of 100% cotton that ensures comfort and that is easy to wash and dry. Not only that, we have hundreds of cute, funny, and laughable Halloween designs that you can choose from and that you can find the perfect gifts for any dog owners and cat owners you know. All our designs are created, printed, and shipped from California, USA. Get your Halloween pet shirt at 365 In Love/365 Printing Inc. Have a spook-tacular Halloween this year with your lovely pets! PET SHIRT - Small to mid size pets ONLY Refer ONLY to 365 Printing size chart for more accurate fitting as the marketplace size chart does NOT provide correct measurements SOFT FABRIC - Made of 100% ring spun cotton, high quality, enzyme washed lightweight material Black sleeve raglan shirts 1 shirt per order UNIQUE PET GIFTS - Cute, funny, and laughable designs offering a wide range of unique pet and pet owners gift options for all special occasions Water base printing ink, eco-friendly quality ensuring safety LAUNDRY TIPS - Wash and dry inside-out in cold water low heat setting Line drying or natural-air drying recommended BEWARE OF COUNTERFEITS - 365 In Love is the brand of 365 Printing Inc. 365 Printing Inc products are designed/printed/decorated in the US and ship only from the US. We NEVER authorize any third party to sell our products in the US and any other countries. Please make sure you buy our AUTHENTIC products from 365 In Love/365 Printing Inc Please let us know if you buy counterfeit products with bad quality or different from the descriptions Add a map to your own listings. FREE Trial!